The bittersweet smell of 'the herb' meets the hard nose of capitalism. Ask a bunch of red-eyed stoners to play a word association game starting with ‘Bob Marley’ and the odds are rather slim that the next words will be ‘investors’ or ‘private equity firm’. The connection has now been made, however, between Jamaica’s favourite son and the commercial exploitation of legal marijuana. 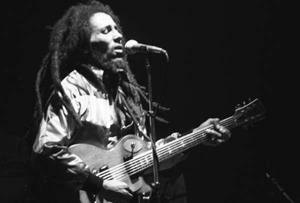 Bob Marley’s once-squabbling family seem to have put aside their differences and moved into the burgeoning ‘cannabusiness’ that’s followed legalisation in several countries and US states. In a joint venture (get it?) with Privateer, a private equity firm from Washington state that specialises in the drug, they’ve created their very own brand of weed, Marley Natural. Wielding Marley quotes like ‘today is the positive day’ and ‘when you smoke the 'erb it reveals you to yourself’, the new firm hopes to tap into the reggae star’s popularity and long association with cannabis. Rohan Marley, her brother, elaborated. ‘Herb is for the healing of the nation, 'erb is for the meditation, 'erb is for the higher vibrations,' he elaborated. Herb might also be for a new swimming pool and a private jet. Cannabis industry body ArcView has predicted the legal market for wacky baccy in the US, where you can now smoke up legitimately in Alaska, Colorado, Washington state, Washington DC and from next year in Oregon, to be worth $2.3bn this year, rising to $10.2bn by 2018. Given the continued earning potential of dead public figures (Marley brought in $20m for his estate last year, according to Forbes), perhaps this could mark the first in series of exciting marketing opportunities. Just imagine how successful a John Lennon LSD brand might be. Profits for Marley Natural and other weed brands that follow could be high as a kite, but if it’s looking for commercial success it might want to keep its own head clear. It’s difficult to be profitable, for instance, if you fail to make a delivery because your entire staff got the munchies. Peace out. Read MT's 'dosh in dope' feature on the legal drugs trade here. Wearables at Work - vote for your favourite now!